MER Editor Marjorie Tesser is excited to announce that the volume she co-edited for Demeter Press with Charlotte Beyer, Dorsía Smith Silva, and Janet MacLennan will be published this March. “Don’t women with children travel?” Marybeth Bond and Pamela Michael enquire, in their book A Mother’s World: Journeys of the Heart (1998), when discovering the absence of portrayals of travelling mothers. 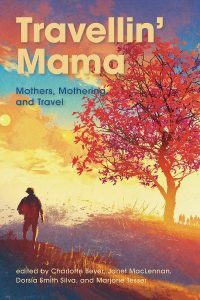 Addressing this absence, our book Travellin’ Mama: Mothers, Mothering and Travel explores the multiple dimensions of motherhood and travel. Through a variety of compelling creative pieces and critical essays with a global outlook and wide-ranging historical, cultural, and national perspectives, Travellin’ Mama: Mothers, Mothering and Travel examines the vital contributions made to travel writing and representations of travel by mothers. Autoethnographical approaches inform many of the pieces in this book, illustrating the significance of the personal and writing the self in re-imagining our cultural narratives and representations of travel, and the mothers who undertake it. This book is about mothers who travel, for mothers who travel with their children, and all those readers who have travelled in any capacity, with or without family.